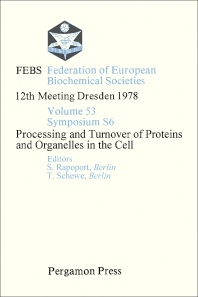 Processing and Turnover of Proteins and Organelles in the Cell is a collection of papers that tackles the problems of post-translational processes, along with the dynamics of cell components. The materials in the title are organized thematically. The text first presents articles dealing with post-translational processing, such as the mode of anchoring of sucrase-isomaltase to the small intestinal brush-border membrane and its biosynthetic implications, as well as the decay and restoring in succinate dehydrogenase. The next papers discuss topics related to the selective degradation of proteins, such as selective control of proteinase action in yeast cells and studies of the mechanism and selectivity of intracellular protein breakdown. The final set of papers covers the turnover of organelles, which includes biogenesis and turnover of peroxisomes, and the effect of oxygen on the synthesis of mitochondrial proteins in Saccharomyces cerevisiae. The book will be of great use to microbiologists and biochemists. Scientists from biological science disciplines will also benefit from the text.